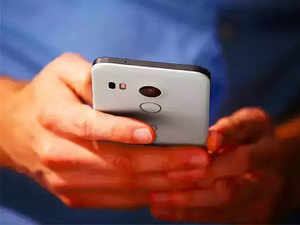 KOLKATA: India’s top three mobile phone makers posted an accelerated fall in revenue in FY18, accounting for less than a quarter of the sales value generated by their Chinese rivals, the latest regulatory filings show. 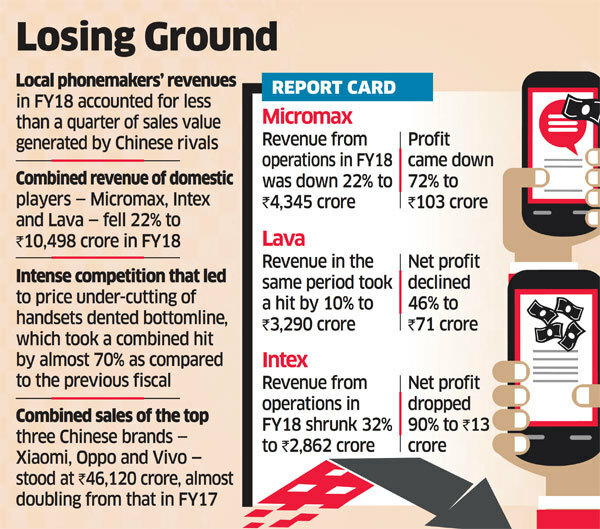 The combined revenue of Micromax, Intex and Lava, which make smartphones and feature phones, fell 22% to Rs 10,498 crore in 2017-18, according to Registrar of Companies filings accessed from business intelligenceplatform Veratech Intelligence. In contrast, the combined turnover of the top three Chinese brands —Xiaomi, Oppo and Vivo — stood at Rs 46,120 crore, almost doubling from FY17. Intense competition led to price under-cutting and dented the bottom line of the Indian companies, which took a combined hit of almost 70% from a year earlier for a combined profit of Rs 187 crore. In comparison, only Xiaomi was profitable at Rs 293 crore, while Oppo posted a net loss of Rs 358 crore and Vivo’s loss was ?120 crore. The revenue decline of Indian phone makers will likely get more pronounced in FY19, with JioPhone, the 4G feature phone from the Reliance stable, gaining leadership due to affordable data bundling and the Chinese brigade strengthening its dominance in smartphones. Micromax Informatics’ revenue from operations dropped 22% to Rs 4,345 crore in 2017-18, while profit declined 72% to Rs 103 crore. Lava International’s revenue in the same period took a hit of 10% to Rs 3,290 crore and net profit fell 46% to Rs 71 crore. Intex’s revenue from operations shrank 32% to Rs 2,862 crore, while profit plunged 90% to Rs 13 crore. The Indian brands got sandwiched between Xiaomi in smartphones and Reliance Jio in feature phones, according to Subhash Chandra, MD of Sangeetha Mobiles, south India’s leading cellphone retail chain with over 575 stores. “Whatever is selling today is only because a retailer takes interest in promoting them due to slightly better margins as compared to the Chinese brands,” he said. Micromax was the fifth-largest smartphone brand in India in 2018, while Lava occupied that spot in the feature phone segment, according to Counterpoint Research. However, the share of both in these two segments was stagnant in 2018 over the previous year — 5% for Micromax and 7% for Lava.